transcosmos inc. (Headquarters: Tokyo, Japan; President and COO: Masataka Okuda; TSE First Section: 9715; hereafter, transcosmos) has agreed to acquire 10% or more of the total outstanding shares of Ookbee Company Limited (Headquarters: Bangkok, Thailand; Founder and CEO: Natavudh Pungcharoenpong; hereafter, Ookbee), which is the largest E-Book store in ASEAN countries. The number of Ookbee’s E-Book application downloads has exceeded 6.5 million, placing it in the Top10 grossing applications for over 700 days in Thailand’s Apple Store. Furthermore, from 2011 to the present, Ookbee has acquired over 5.5 million members, and it is a rapidly growing business anticipating more than 10 million members by the end of 2014.
transcosmos will become shareholder in Ookbee, together with INTOUCH, a holding company focusing on telecommunication, media, IT and digital content businesses. INTOUCH holds majority stakes in AIS - the largest mobile operator in Thailand. AIS occupies more than 50% market share with more than 40 million subscribers. 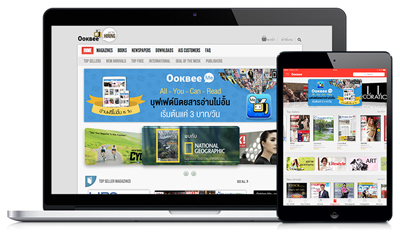 Ookbee has partnered with AIS to distribute digital books and magazines. In addition, Ookbee has worked closely with SAMSUNG in the developing and launching an all-you-can-read application called mZine which is available to SAMSUNG’s customers in Southeast Asia. Ookbee is not only present in Thailand, but has been developing services in other ASEAN countries (Malaysia, Philippines, Vietnam, Singapore), and this new increase of capital is intended for the purpose of expanding operations in each country, including Thailand. Furthermore, transcosmos and Ookbee are aiming to launch E-Commerce business utilizing the membership data of Ookbee (subscription history and membership attributes, etc. ), as well as assets such as the media and content possessed by Ookbee. With this new capital and business alliance, transcosmos plans to dispatch personnel including executive officers, and it will continue to introduce know-how and systems it has cultivated up until now in Japan to Ookbee, including digital marketing, advertising operations, data analysis and customer support. In addition, there are plans to continue broad cooperation as a partner in order to accelerate the “Global E-Commerce One-Stop Services” that transcosmos is promoting, including support in the future for the E-Commerce entry of transcosmos’s customers into the ASEAN market by utilizing Ookbee. Additionally, the Founder and CEO of Ookbee, Natavudh Pungcharoenpon, is scheduled to appear as a speaker at the “New Economy Summit 2014”, which is to be held at the Hotel New Otani Tokyo on April 9 - 10, 2014.